Taking care of your smile has been proven to provide substantial health benefits in comparison to neglecting your teeth. From daily brushing habits to annual dental exams, it falls on you to put in the effort and time to keep your teeth shining for a long time. As Concord’s general dentistry experts, we’re here to offer a wide range of family dentistry services. Our comprehensive approach ensures a personalized plan is in place to best meet your needs. 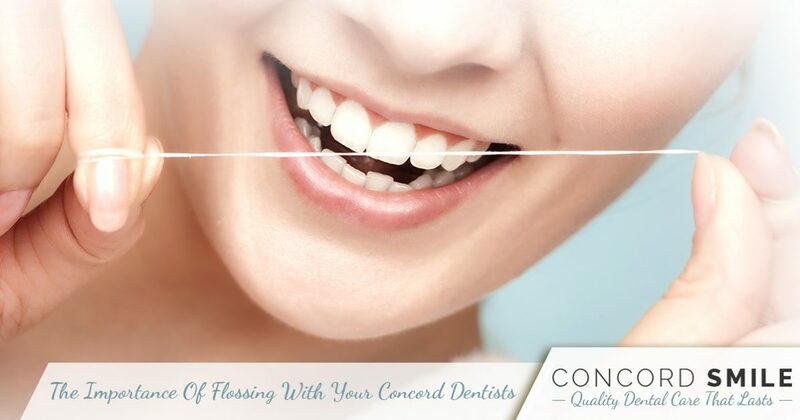 Whether you’re dealing with caries or need a tooth extraction, the Concord Smile team will be here and ready to deliver the best results possible. One area that many people contest their dentist on is gum health through flossing. The benefits of flossing are many, and not worth ignoring. Today, we’ll look at a few of these benefits to set the record straight on flossing. If you’re in need of a local dentist in California, be sure to contact our Concord office today! Daily engagements of mechanical interdental cleaning measures will prove to be a boost for your smile. One reason that flossing, when done with the proper technique, is so helpful is that it can fight the buildup of plaque. This cleanup of plaque has been shown to help keep both your teeth and gums healthy. When food and debris get lodged in between your teeth, the opportunity exists for bad organisms to begin populating and attacking the surrounding areas. Flossing will help to clear out these hard-to-reach spaces, preventing buildups of harmful bacteria and tartar, which is a thick deposit that will need to be removed by a professional. Flossing is also important for the aesthetics of your teeth! The cleaning actions of this task remove unsightly build ups of food, leaving you with a brighter, cleaner smile. Flossing also provides an opportunity for you to take a closer look at your teeth and gums in case any potential health hazards or symptoms are present. The sooner you receive medical attention for any issues found, the better! Inflamed and bleeding gums are problems that can lead to long-term complications if not resolved in a timely manner. Anyone dealing with the first stages of gum disease will be in the midst of dealing with Gingivitis. If your gum health isn’t improved, eventual gum and tooth loss can occur. Studies have also been done to show links between gum and overall health. If you are dealing with serious oral issues, organs such as your heart can suffer as a result. Introducing flossing into your brushing routine can prove very helpful with additional plaque protection and gum cleaning. Don’t leave your health to chance! While the verdict is unclear for certain citizens, the experts here at Concord Dental are sternly set on having our patients floss. Doing so will help in promoting better health practices and a happier smile overall. We are proud to be Concord’s general dentistry providers, supplying comprehensive services to all of our patients. If it’s been awhile since you have flossed, or if you cannot remember your last dental exam, be sure to contact us today to schedule an appointment!